In June 2013, a vintage City College building, known to students as the Student Services and Administration of Justice building, was torn down and a construction project to create a new student services building began. According to City College Vice President of Administrative Services Robert Martinelli, the new two-story building, which will include 16,000 square feet of usable space, doubles the space of the original building, and is on schedule to meet its February 2015 completion goal, partly thanks to California’s recent dry weather. The new building will house Student Services on the first floor and the top floor will be the new home of the photography and journalism departments, according to Martinelli. 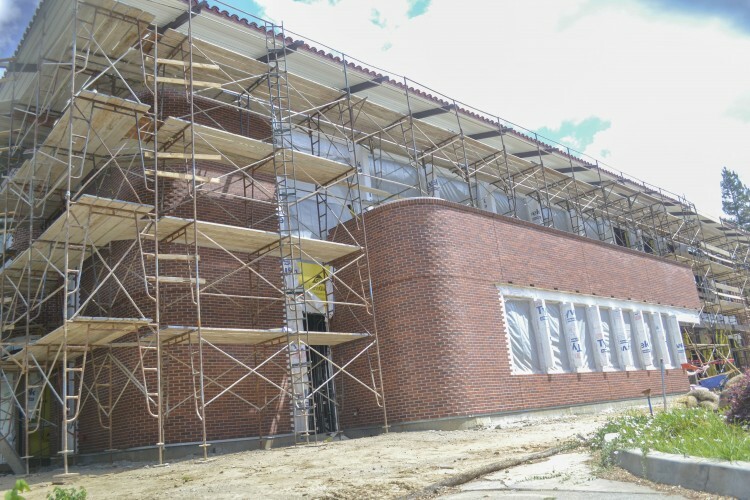 In addition to the new building’s construction, the Lusk building is also undergoing a construction phase, also due to be completed in 2015. Following that, a revision, which Martinelli says is currently in design, to Rodda Hall North will be the next project. The next projects on tap, according to Martinelli, are renovations of the Mohr Hall and Lillard Hall buildings. But Martinelli said these projects are held up because of a lack of funding. Martinelli said pending whether a measure for funding passes in 2016 or not, these projects would need to be reevaluated. The next phase of the project, following Mohr and Lillard’s facelifts, which are both scheduled regardless of where funding will come from, would be to expand the West Sacramento and Davis outreach centers, Martinelli said. For now, the focus is on the new student services building. Vice President of Student Services Michael Poindexter said that before the building began construction, student, faculty and staff opinions were taken into consideration in an effort to make an easier, more streamlined process for new and existing City College students. From this feedback, the college began looking at how to best combine the offices into a space that would make them more easily navigable. Poindexter added that he feels the building’s design will cut down on student confusion and large crowds, especially during the first few weeks of the semesters and that overall, the new setup will provide better “customer service” to the students. Photography Professor Paul Estabrook got a chance to take an inside tour of the new building recently and said he’s excited to move into the new space soon. Estabrook said in terms of construction, the best part is the openness of the building. Estabrook shared Poindexter’s sentiments that the new building will be welcoming for students. Additional reporting by Will Ownbey. This entry was posted in News, Sac City Express (SCC) and tagged Administrative Services Robert Martinelli, Bell Cooledge, City College, daniel wilson, Express, Martinelli, new building, Robert Martinelli, Sac City College, sacramento, student services. Bookmark the permalink.